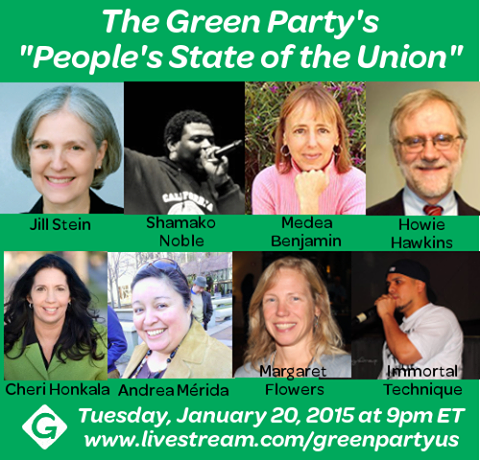 WASHINGTON, D.C. -- The Green Party of the United States invites members and the public to tune into "The People's State of the Union" and participate in an online chat during President Obama's 2015 State of the Union speech on Tuesday, January 20, on the Green Party's Livestream channel (http://www.livestream.com/greenpartyus). The State of the Union, which begins at 9:00 pm ET, will be aired on the Livestream page. A chat box will for discussion will be on the screen next to the live State of the Union video. After the President's speech, Jill Stein, the Green Party's 2012 presidential nominee, will interview guests about the State of the Union. Following this segment, viewers may continue the informal discussion in the chat box. The organizations listed above are for identification purposes only. More guests will be announced soon. Viewers are encouraged to contribute questions for the guests. The guests will be on the Livestream broadcast via remote webcam on Google Hangout.